We've just 2 rounds to go now until teams start creating the history that fans will remember - fondly or otherwise - and neither the top 4 nor the top 8 positions are all locked in. Surely the practical science of statistics can help us to determine the chances for each team that is still in the running. The three scenarios are labelled Base Case, Stronger Favourites and Weaker Favourites, with the probabilities for the first 8 games in each scenario based on the opening head-to-head market prices on TAB Sportsbet and the remaining probabilities set to be broadly consistently with the scenario name. 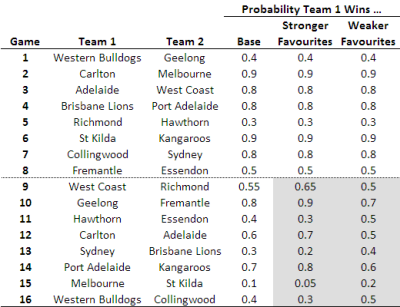 So, for example, in the Base Case scenario, West Coast are slight favourites over Richmond in Round 22, as they have an assigned probability of 55% (ie 0.55). This rises to 65% in the Stronger Favourites scenario and 50% - that is, equal favouritism - in the Weaker Favourites scenario. Okay, now to the interesting part: what outcomes do we get for each of these scenarios? The Saints and the Cats almost always finish 1st and 2nd, in that order. Looking at the actual simulation results (not shown here), in a tiny number of instances - less than 1 time in 100,000 - the Saints and the Cats swap places, but not often enough for this to be considered a serious possibility. So, the Saints' most likely finish is 1st and the Cats' is 2nd, both with probabilities close to 100%. Collingwood finishes in the top 4 in all but about 1-2% of the simulations, regardless of the scenario. The more detailed simulation results reveal that Collingwood finishes 3rd about 75-85% of the time, 4th 10-20% of the time, and 5th about 1-2% of the time. Their most likely finish is 3rd. The Western Bulldogs finish in the Top 4 about 56% of the time under the Stronger Favourites scenario and 70% of the time under the Weaker Favourites scenario. They always finish in the Top 8 under any scenario. They could finish anywhere from 3rd (with probability ranging from 15 to 25%) to 7th, though a finish this low is very unlikely. Their most likely finish is 4th, for which the probability is about 40-45%. Carlton finishes in the Top 4 about 17% of the time under the Weaker Favourites scenario and 32% of the time under the Stronger Favourites scenario. They too always finish in the Top 8 regardless of scenario. They could finish as high as 3rd, though this is very unlikely (probability less than 1%), or as low as 7th (with probability around 20%). Their most likely finish is 5th, for which the probability is about 35%. Adelaide is another team that always makes the Top 8 under any scenario. They also make the Top 4 about 10% of the time under any scenario. They could finish as high as 3rd, though this is very unlikely for them, or as low as 7th (with probability of 30-50% depending on scenario), which is their most likely finish. Brisbane Lions are also a simulated certainty to make the Top 8, but they've only a 2-3% chance of making the Top 4. Their best possible finish is 4th and their worst is 8th (with only about a 1% probability). Their most likely finish is 6th or 7th depending on the scenario, and the combined probability for such these two positions is about 70-80%. Essendon are no chance for a Top 4 spot and a 72-78% chance of a Top 8 spot, depending on the scenario. Their best possible finish is 7th and their worst is 11th. Both have associated probabilities of around 1%. Their most likely finish is 8th, for which the probability is 70-80%. Port Adelaide are also no chance for a Top 4 spot, but are a 13% chance of a Top 8 spot, regardless of the scenario. Their best possible finish is 8th, and their worst is 12th, though this carries only a 1% probability. Their most likely finish is 9th, for which the probability is 45-65%, depending on the scenario. Sydney are also no chance for a Top 4 spot and virtually no chance for a Top 8 spot. The probability of them making the 8 ranges between about 0.5% to 1.5% depending on the scenario. Their best possible finish is 8th, and their worst is 12th, with a probability of 15-30%. Their most likely finish is 11th, for which the probability is about 40%. 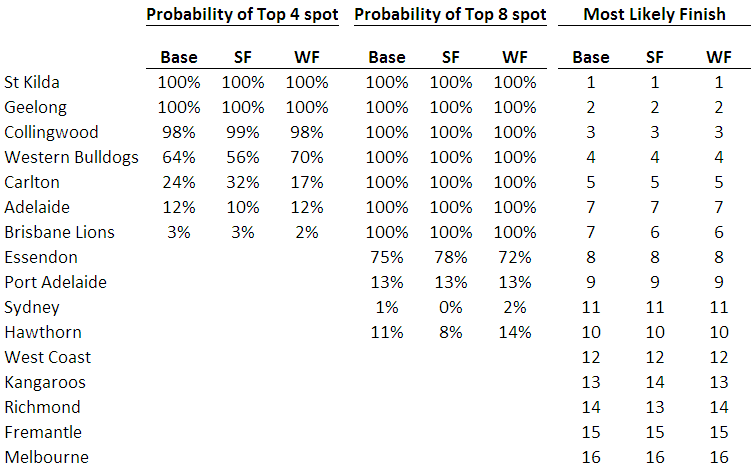 Hawthorn are another team with no chance for a Top 4 spot, but the probability of them making the 8 ranges between about 8% and 14% depending on the scenario. Their best possible finish is 8th, and their worst is 12th, with a probability of 10-15%. Their most likely finish is 10th, for which the probability is about 30-35%. No other team finished in the Top 8 in any of the simulations for any of the scenarios. The Dees are a 90-95% chance for the Spoon, though the Roos, Richmond and Fremantle all have non-zero probability of finishing last. Fremantle is a 5-10% chance, while the Roos and the Tigers both have probabilities less than 0.5% under any scenario. Which is probably why, on TAB Sportsbet, there is no longer a Spoon market.